A reader recently suggested something that, frankly, hadn’t occurred to The Legal Genealogist. Maybe sometimes, she suggested, people are confused between Black and Blackstone. If people can confuse this John Johnson for that John Johanson, even though they’ve been studying the Johnson (and Johanson) families for years, then getting Black and Blackstone confused when they don’t use them often isn’t all that surprising. So… here’s the essential difference. 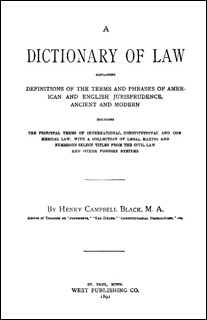 When folks in the genealogy world talk about Black, they’re almost always talking about Black’s Law Dictionary.1 It was edited by Henry Campbell Black. But his enduring legacy to the law, and to genealogists, was his absolutely classic Black’s Law Dictionary. It’s a comprehensive dictionary of legal terms — many of them critical to the records we work with day in and day out — that gives new meaning to the concept of “Gold Standard.” Let me put it this way: if a legal term you’re trying to figure out isn’t in Black’s, then it’s probably spelled wrong. 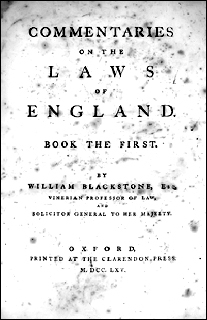 When folks in the genealogy world talk about Blackstone, however, what they’re referring to is Blackstone’s Commentaries on the Laws of England.8 This four-volume set was penned by an English jurist, William Blackstone. William Blackstone is, if anything, even more important to the law and to genealogy than Henry Campbell Black. So why do we as genealogists care about Blackstone? Because so much of what he wrote about is part of the law our ancestors lived by. Want to know about marriage and divorce at common law? The Commentaries cover that. How about inheritance and who got what if there wasn’t a will? Yep. That’s there too. Master and servant, parent and child, even criminal law. All there. So Black wrote a dictionary, Blackstone an explanation of the common law… and both of them should be on a genealogist’s bookshelf. Thank you, Judy (and thanks to your reader who brought this up. I knew OF Blackstone, but hadn’t the background to grasp what his work meant. Now that you’ve explained it, it makes perfect sense. I have Black’s. Now I need to run down access to Blackstone, because it is clear that his Commentaries would have considerable influence for the period I am most interested in. Annie, you’ll find versions of Blackstone’s Commentaries all over the online sites. The one I cited to, the Avalon Project from Yale Law School, isn’t the best (the OCR turned a lot of long S letters into F letters so it’s hard to read) but it will work. In addition, check Google Books, Internet Archive and HathiTrust. They all have lots of versions of the Commentaries. Thank you for the pointers, Judy. It’s good to know what to look for- and what to look out for!